Billy Creekmore is a spunky orphan with a talent for telling tales and hearing spirits. He was born at midnight on Friday the 13th and has always been told that he's destined for a life of bad luck and hardship. In 1905 West Virginia, Billy's story starts out at the Guardian Angel Home for Boys where he's starved and worked hard by the miserly couple that runs the orphanage. Billy's only hope is to be sent off to the glass factory when he's old enough. However, when a fellow orphan returns from the glassworks with a maimed hand and reveals the truth that it's a dangerous place where kids risk their lives for pennies a day, Billy knows he's got to get out. Luckily, his aunt and uncle show up in the nick of time to whisk him away to a coal mining town. What follows is the rest of Billy's adventures - learning to drive a coal mule, joining a traveling circus, and searching for the father who abandoned him. The first thing I noticed about this book was Billy's great voice. He's cocky and funny and he really reminded me of Bud from Bud, Not Buddy. Throughout the book, Billy's voice is entertaining and matter-of-fact, even about some of the outlandish things that happen to him. Plus, you have great chapter titles, like "Chapter Two: I Frighten the Snake-Handling Preacher and Mr. Beadle, Then I Tell Rufus a Secret". The other thing I really, really like about this book is its sense of setting. Porter's obviously done her research and the West Virginia coal mining town jumps to life as you read. Porter includes a fairly extensive author's note (y'all know how I adore them) about how she came up with the idea for Billy and how much of it is based on her actual ancestors. Now. There is one thing that bothered me about this book. Things seem to happen to Billy just in the nick of time. His uncle comes to get him at the orphanage the day before he's supposed to be sent off to the glass factory. When disaster strikes in the mine, he just happens to be with an older boy who helps him escape and not by himself as he spends much of his days. And there are more examples, but they give away some important plot points. The more I sit and think about this book, the more examples I come up with. Billy never seems to do anything on his own. He's always being rescued in the nick of time. The ending especially was what bothered me, with everything coming back together and tied with a neat little bow (except the fates of certain important characters who I am still wondering about). That said, I still enjoyed the novel. I think its attention to child labor issues are especially good and it would be great for a classroom discussion about child labor, unions, or the turn of the century. Billy's voice is appealing enough for me to overlook the deus ex machina bits. For further reading suggestions, I suggest Bud, Not Buddy by Christopher Paul Curtis if you're looking for a similar funny male narrator. If you're looking for more about child labor and/or unions, try Lyddie or Bread and Roses, Too, both by Katherine Paterson. If you're an adult (young or old) and loved the Appalachian setting of Billy, I can't recommend Clay's Quilt by Silas House strongly enough. Other reviews can be found at Little Bitty Book Reviews and Becky's Book Reviews. 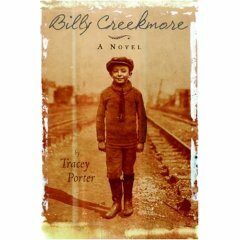 Also, Billy Creekmore is on the Anderson's Mock Newbery List.